Streams in Green Diamond California's forests are the spawning and rearing grounds for a number of species of salmon. Most of these species like the coho, chinook salmon and steelhead are anadromous (those that return from the ocean as adults to spawn in freshwater). This means that much of what happens during the life cycle of anadromous salmon happen when the fish are in salt water. However, we can have an influence over the freshwater environment, and it is very important to Green Diamond to ensure that our timber operations do not have a negative impact on the spawning and rearing habitat for these salmon species. As a result, Green Diamond has initiated surveys and monitoring to assess the current habitat condition and the number of juvenile fish that occupy these streams. The goal is to ensure that conditions for spawning and rearing salmon remain suitable or improve, and to document changes in fish numbers over time. To learn more about some of the fishery subjects, select from any of the links below. There are three phases to fish population monitoring. 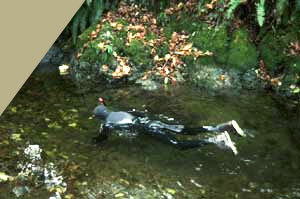 Spawning surveys are done in the winter to determine how many adult fish have returned from the ocean to spawn. The monitoring of juvenile fish is carried out during the summer to estimate how many young fish are rearing in the streams. Catch and release trapping is done in late winter and spring to estimate the number of juvenile fish that have survived to become smolts (young fish) that will head back to the ocean to begin their adult life. View the Habitat Conservation Plan/Candidate Conservation Agreement PDF. Trained fisheries biologists walk the primary spawning streams during the winter and count the number and species of adult fish that are seen actively spawning, or they look for the evidence of nests in the gravel where the eggs are deposited, which indicate that fish have already spawned in the stream. This information is valuable to determine if the numbers of young fish in a stream are being limited by the return of adults from the ocean. Estimates of summer populations of juvenile fish are obtained through a combination of snorkeling and fishing surveys. The under-water counts of the young fish made by trained observers with snorkels and wetsuits are preferred, because no fish are harmed. Juvenile population estimates are being gathered on eight streams each year across Green Diamond's California ownership. These numbers are important to determine how many juvenile fish have survived to emerge from the gravel nest and occupy available rearing habitat. The status of the final stage in the freshwater cycle of an anadromous salmon is estimated using traps that capture the smolts (juvenile fish that have become physically ready to enter the ocean environment) as they move down the stream toward the ocean from their wintering habitat. These surveys, although very labor intensive and expensive to conduct, provide invaluable information on the "bottom-line" of how many smolts are being produced in the freshwater environment. Comparing the survival rates between summer populations and the smolts migrating to the ocean can also help us determine the limiting factor for smolt production. Currently, Green Diamond is trapping on four tributaries in the Little River watershed. As noted above, much of the life cycle of anadromous salmon occurs in the ocean, which means that changes in their populations may be due to factors outside the freshwater environment. Therefore, we cannot depend solely on changes in the population levels of the fish to determine if the freshwater spawning and rearing habitat is adequate to maintain viable populations of the fish. Since anadromous fish populations are not reliable indicators of freshwater habitat quality, we also monitor critical habitat attributes, such as water temperature, to determine if they are within acceptable ranges. Using remote data recorders 358 water temperature profiles on approximately 100 fish-bearing streams, and 183 temperature profiles on approximately 70 headwater amphibian streams have been documented across Green Diamond's ownership. These data indicate that water temperatures are generally ideal for fish and amphibians on Green Diamond's California ownership. 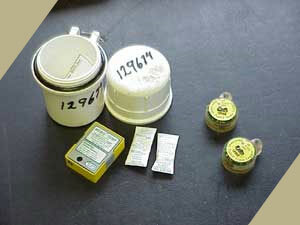 Two types of temperature data loggers used to measure water temperature. HOBO (left), TidbiT (right). The amounts of coarse and fine sediments that are delivered to streams are also important factors influencing the quality of spawning and rearing habitat for salmon. 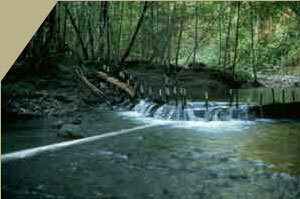 Green Diamond has adopted a multifaceted approach to evaluate and monitor sources of sediment in streams. Green Diamond is monitoring the fine sedimentss that can smother developing eggs or interfere with foraging juveniles. 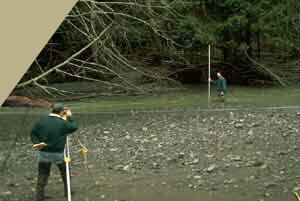 Coarse sediments are also being monitored by directly measuring changes in the depth or width of the stream channel. If the channel becomes wide and shallow, then too much coarse sediment is being delivered to the stream, while a narrowing and deepening of a channel is an indication that sediment sources are being reduced.